Any guesses as to what this post is about?! So get this you go up at a 45degree angle UP 200 feet, level out round a circle, get a nice view of the park and all of the sudden you reach the end and hang in the air with your feet dangling, praying to whoever you believe in that you live through this. Then BAM 5 seconds later the brakes release and you FALL 90 degrees going 70 MPH reaching 4G's! That is only the FIRST drop! The second isn't as horrifying but it's enough to make you scream then BAM you hit water, go around a building and head back into the loading dock. Any guesses as to what Roller Coaster this is about?! 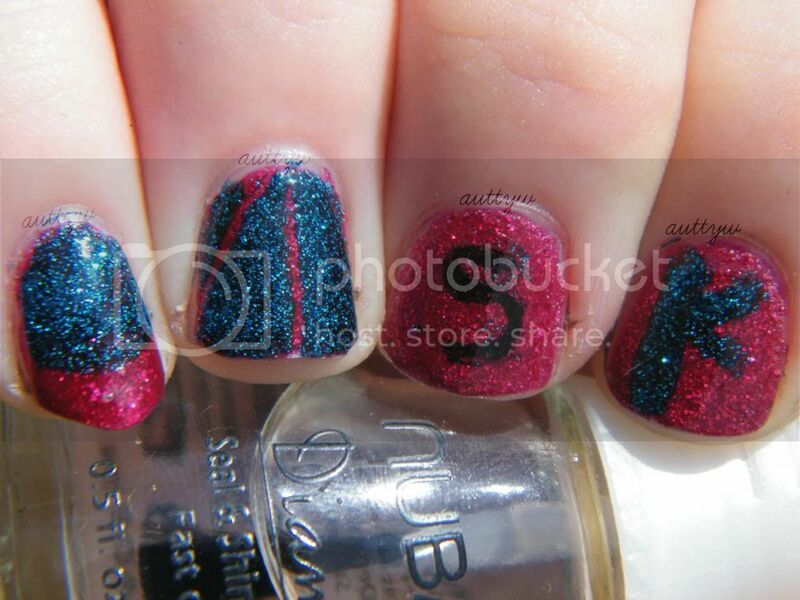 This is the FIRST time I have ever participated in a challenge from the Hobby Polish Bloggers group! I actually always wind up missing them or not even realizing that there is one. Definite fail. SURPRISE! It's SheiKra at Busch Gardens Tampa Bay! The reason I chose SheiKra is because I have personal significance with the ride. It was the SECOND coaster I ever rode and the only reason I rode it is because my Cousin FORCED me... Seriously he forced me to ride it. I was a mess. I had a panic attack, cried like a baby the ENTIRE RIDE. DON'T judge me. I actually wound up riding it twice. Even though I still love coasters, my hips don't agree with them so much. So I've avoided coasters for a few years.. 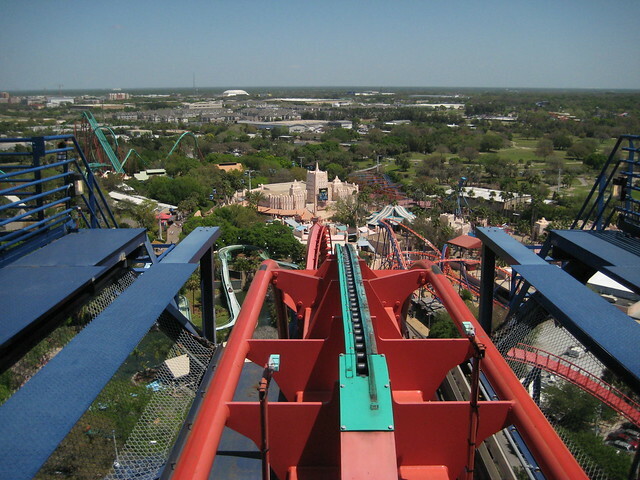 When I first road SheiKra it had floors, but Busch Gardens decided to change that in 2007 and took the floors off. It makes for a more intense ride if you believe it! Not only was SheiKra the first "big boy" coaster that I rode, the other reason I chose it was because my Dad works at the Zambia Smokehouse (if you ever go and see Roy say Hi! That's mi padre!) so he gets to see SheiKra everyday! Holla! I love watching the first drop and it hitting the water. Plus it makes the entire Antares shake which I find funny. .Ok back to the topic at hand. I chose red and blue because when you first drive up to the park that is what you see. 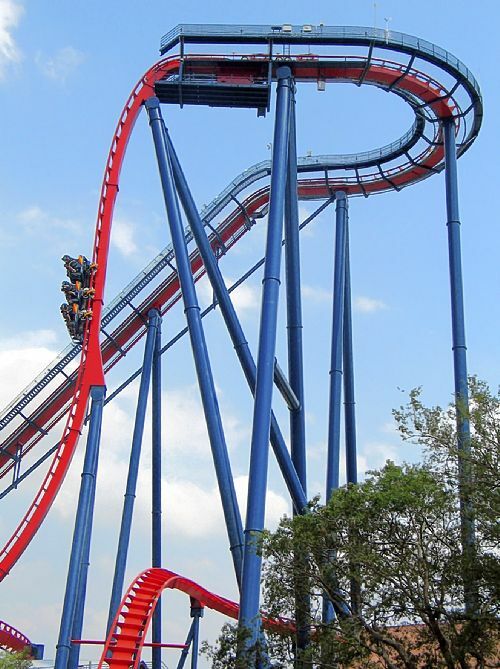 The main part of the ride is red and posts etc are blue. I was going to use two China Glaze polishes, but I decided to go in another direction when a different top coat I used NEVER dried. That's life right!? On my Pinky I attempted a half circle. It represents the circle you take before the plunge. My Ring finger represents the 45 degree angle UP and the 90 degree angle DOWN. My middle finger has an S in black sharpie because I don't have nail art brushes and and I wanted to break up the look of red and blue. My index finger has the K in Liberty. The SK are the capitalized letters in SheiKra. 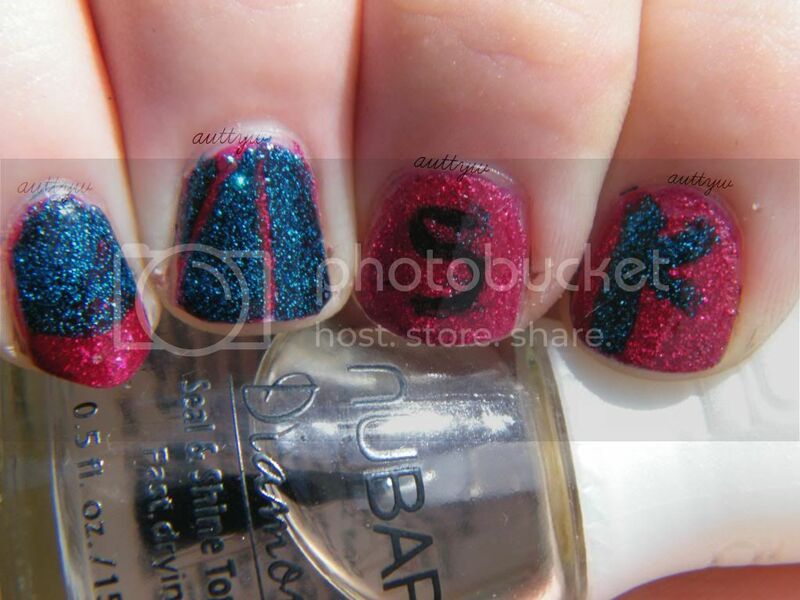 Do you like this mani!? I know it's not the greatest but it was an attempt! Did I do okay for my first attempt at actually doing something themed?!?! Oh. My. Gosh. I'm afraid of roller coaster, but this one seems pretty cool. Roller coasters are pretty scary and intimidating every time you ride them, but it's such an adrenaline rush!